Farah province has seen heavy fighting in recent months, with local officials and tribal elders requesting additional forces to support the overburdened army and police. Afghan forces have struggled to combat the Taliban in recent years, as the insurgents have seized several districts across the country. Kabul: Security forces pushed back an attack by Taliban insurgents on Wednesday and took control of Farah city in western Afghanistan, officials said. Farah provincial Gov Abdul Basir Salangi said more than 300 Taliban fighters were killed in the gun battles in the provincial capital also called Farah. The Taliban launched attacks from multiple directions early Tuesday aiming to gain control of the city but later faced resistance from reinforced security forces. Salangi said at least 25 government troops were killed. Amin Rahman Mujadedi, an official from the provincial health department, said 28 bodies were transferred to a hospital since the start of the battle and 66 wounded received treatment. He said the majority of those were security forces. Gen Mohammad Radmanish, Defence Ministry spokesman, said Farah city was cleared of insurgents Wednesday and Afghan forces were chasing Taliban fighters outside of the city. He said Afghan forces established additional checkpoints to provide security. Mohammad Sarwar Osmani, a lawmaker from Farah, said residents were trying to get their lives back to normal. “Shops are open today and people are out on the streets in the city,” he said. Afghan forces have struggled to combat the Taliban in recent years, as the insurgents have seized several districts across the country. The US and NATO formally concluded their combat mission at the end of 2014, but still provide support. NATO said in a statement Tuesday that A-10 close support fighter jets were circling Farah, which it said was under government control. The Taliban claimed responsibility for the assault on Farah in a statement to media, saying they attacked from multiple directions. Separately, in eastern Ghazni province, at least 14 policemen were killed, including a district deputy police chief, after Taliban fighters launched attacks on their checkpoints, said Arif Noori, spokesman for the provincial governor. More than 20 other security forces were wounded during simultaneous attacks, “There is a sporadic gun battle going on in Jaghatu district where Taliban stormed police check points,” added Noori. Zabihullah Mujahid, Taliban spokesman, claimed responsibility for the attacks in Ghazni. Andar and Gilan districts were two other areas where came under attack, but right now are under control, said Noori. A total of 43 Taliban fighters were killed during the battles in three different districts, he added. 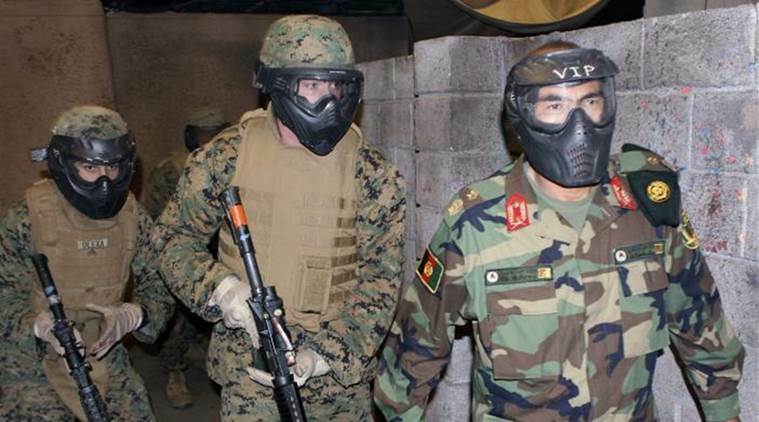 Taliban insurgents have stepped up their attacks against the Afghan security forces as well as government officials since the announcement of their spring offensive last month across the country.